There are multiple species of birds that make their home in Sydney and South West Sydney properties, invading roofs and causing all kinds of problems, both structural and health related. Birds have become well adapted to urban environments, meaning they are common household pests. Most birds will gain entry to your property via damaged roofing, vents, downpipes and chimneys. Birds will often cause corrosive damage to properties and are known to spread diseases and parasites such as bird lice. St George Pest Control can aid in the removal of all types of birds within Sydney and South West Sydney. Contact us for a free quote and eradicate your bird infestation. Large birds with small heads and short legs. Their markings are usually yellow, green and red-purple along their neck. With a grayish-pink beak. Pigeons are messy birds and don't keep nests very clean. Gather in flocks to feed. Light to medium grey colour, brown wings. Move in flocks, may drive native birds from area. Nests built near or in buildings. Small in size. Speckled in colour, medium size, they are noisy. Will often build nests in gutters and large groups of starlings will result in large quantities of waste. Brown and black in colour with an orange beak. Aggressive during nesting season, gather in large numbers to feed. Attack native birds, are noisy and unclean. They steal nests from smaller birds. Bird droppings - birds will defecate outside their nests, on your roof and eaves of your proerpty. High levels of insect infestations - Birds can attract certain insects to your property. Bad smells - Birds smell due to their feces. Noise - Birds will make loud noises, flocks of birds cause incredible amounts of chirping and tweeting. Damage to roof and eaves - birds will tear holes in your roof or widen cracks in joints to build nests. 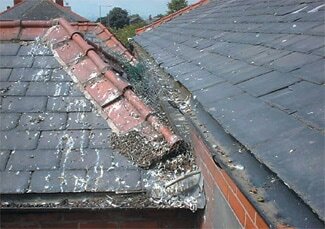 Property Damage - Damage to gutters, downpipes, tiles on your roof and corrosion to paint caused by the uric acid context in birds droppings. Diseases - Fungal diseases closely linked to bird droppings include cryptococcosis, histoplasmosis, Newcastle disease, psittacosis, gastroenteritis, encephalitis, toxoplasmosis and aspergillosis. Other pests - Mites, ticks and lice are often found living on birds or in their nests. Noise - Large groups of birds roosting together can cause considerable noise. Invasive species - Many birds considered pests are invasive and destroy the nests and may even kill native bird species.